Ta-Da! My first ever training plan! Fact: Spreadsheets in excel make everything look so official! 94.7 FM has been playing this song non stop! And really, I can’t blame them! This is the first song I have heard from Gotye and I am already addicted. I just had lunch with Danielle and she just raved about him and his album “Making Mirrors.” And trust me, my girl Danielle has wonderful taste in music! She promised to burn me the CD…I am so excited to get my little hands on it! The video actually made me love the song even more. And you HAVE to check out a cover of this song by Walk off the Earth. One guitar for five people? Check it out, it’s definitely worth your while! First off, I love love love having people visit my blog! But I also have a fascination of finding out how they got here. It’s a strange sort of curiosity that all bloggers have, I am not ashamed to admit that it is a fun little game! From my blog dashboard (doesn’t that sound exciting?!) I can see the search terms readers use to find my blog. But some of these search terms for “Life of Roya” are just…strange! They are so random and hilarious and are just too good not to share! I kind of just want to meet these people, I hope they eventually found what they were looking for. As long as Google keeps driving traffic to my site, I don’t care what they are searching for! Thanks Google! I love the original Tom Petty version, but I can’t help but admit that the bluesy John Mayer version rocks. It totally reinvents the song. So I was recently introduced (well, more like discovered…) The Pioneer Woman. And let me tell you, SHE ROCKS! She has the best blog I have ever seen and her recipes are to die for! I have spent hours just looking through her posts and recipes. I made it for Bridgette a couple weeks ago (she of course supplied the wine!) and I made it for Steven earlier this week. They both were happy campers with their dinner! It was cheesy, filling, and really flavorful. 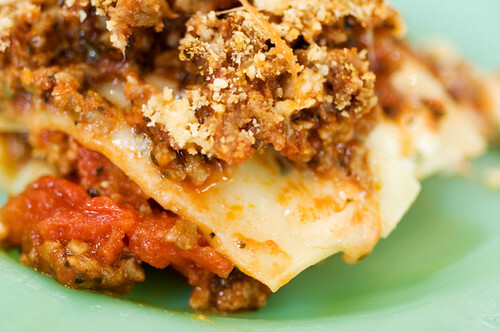 What more could you want in lasagna?! This lasagna recipe is super easy to make and it is absolutely delicious! It is a pretty big batch, which is perfect for next day leftovers and lunches! I tweaked the recipe slightly just based on the ingredients I had in my kitchen (check the original recipe). And don’t let the cottage cheese deter you, I promise promise promise it is a great addition to lasagna! Also, my lasagna(s) were not nearly as pretty as The Pioneer Woman’s, so I will add her beautiful photo, which will give you an idea of this amazing dinner! In a large skillet or saucepan, combine ground beef and garlic. Cook over medium-high heat until browned. Drain half the fat. Add tomatoes, tomato paste, 2 tablespoons oregano, basil and salt. After adding the tomatoes, the sauce mixture should simmer for 20 minutes while you are working on the other steps. In a medium bowl, mix cottage cheese, beaten eggs, grated Parmesan, and 1 more teaspoon salt. Stir together well. Set aside.